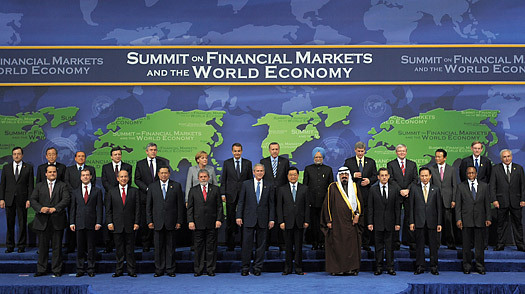 The G-20 Summit: Can This Group Save the World Economy? If those attending the G-20 summit in London this week want a quick lesson on how economic booms can turn into busts and how grandiose bets on real estate plays can get you into trouble, they would do well to learn the lesson of their surroundings. The summit of leaders from 19 of the world's key economies will be held in London's docklands, just east of Canary Wharf, a real estate megaventure conceived on industrial wasteland in Britain's go-go 1980s. By the time the first part of the project was completed in the early 1990s, Britain was in a deep economic slump, and the project's developer, the Montreal-based Olympia & York, went bust. The G-20 is an informal body that groups together not just the leading advanced industrial economies, who have their own club in the G-8, but also "emerging market" nations such as India and China, together with middle-income economies such as South Korea and Mexico. Together, the 19 nations (plus the European Union, which explains the 20  though the World Bank and IMF are also members of the G-20, just to confuse things) account for about 90% of world GDP, 80% of world trade and two-thirds of the world's population. The London meeting will last only a day, and its agenda is potentially vast, so don't expect everything to be settled. Remember, too, that the outcomes of international summits are, in the jargon, "precooked." That is to say, unless something goes really wrong, the final communiqué will have been hammered out in advance by the summiteers' "sherpas"  the officials who do the heavy lifting for heads of government before the grand panjandrums get together for their little chats.  A coordinated stimulus. Aggregate demand in the world economy is shrinking as corporations, households and especially financial institutions rebuild their balance sheets and unwind the massively leveraged positions they took in the past 10 years. To put some heft back into the economy, the IMF has recommended an injection of demand equivalent to 2% of world output. The U.S. has taken the lead on a stimulus package, but some European nations  which tend to be wary of long-term national budget deficits  have balked at the size of the new resources required.  Reform of regulatory regimes. The crisis has made plain that the global economy is now so intertwined that a collapse of a financial institution in one country can have a knock-on effect around the world. The summiteers will discuss global regulation not just of conventional commercial banks, but also of other parts of the financial system like hedge funds  a key European demand. They probably won't get far  this time.  Reform of international financial institutions. The World Bank and IMF originated in planning for postWorld War II economic reconstruction, and there is broad agreement that their mandates need rethinking. The IMF needs a fresh injection of cash if it is to help stabilize economies in a mess, and developing world nations  who will lead the recovery, when it comes  are campaigning for a greater role in shaping the priorities of these institutions. Expect the issue to be punted downfield for further discussion later in the year.  Avoidance of protectionism. World trade, which has been the essential driver of poverty-relief in much of the world, especially in Asia, is contracting faster than the global economy as a whole. When they met in Washington last November, G-20 leaders pledged to set their faces against protectionism and to revitalize the moribund "Doha Round" of talks on world trade liberalization. Since then, says the World Bank, no fewer than 17 of the G-20 member nations have adopted a variety of protectionist measures  and there's no sign of any movement on reviving the Doha talks. The summiteers can be depended upon to adopt some ringing denunciation of protectionism. How much it will mean, God knows. Will the summit achieve anything? It would be a surprise if it broke up in disarray  the stakes are too high for that. But it would be as surprising if measurable progress were made on every item on the agenda. Nonetheless, there is always hope  as summiteers could discover if they consider their surroundings. Canary Wharf may have looked like a white elephant in the 1990s, but  not without some trials and tribulations  it has since become an essential part of London's economy, expanding the center of that amoeba-like city to the east. So do big bets on real estate ever pay off? Anyone who saw the sheer scale of decrepitude and decay of London's docklands in the early 1980s like I did will need no convincing that they sometimes do. In the ever turning cycle of economies, booms turn into busts, all right. But busts, too, come to an end. Next Is Obama Risking Summit Overload?